Polaris Blueberry is a Half-High Blueberry selection from the University of Minnesota that was introduced in 1996. Combining the flavor of one of the best Northern Highbush (Vaccinium corymbosum 'Bluetta') and the cold hardiness of a Lowbush cross selection (Vaccinium corymbosum x angustifolium 'G65 x Ashworth'). Polaris is one of the best tasting, hardy Half-High Blueberry selections ever! Half-High hybrid Blueberries have become the hit of cold winter Blueberry growers. The Polaris is extremely cold hardy. It produces a bountiful crop of wonderful flavored fruit on a perfectly sized plant for the average landscape. The Polaris produces medium sized, shiny, fragrant, light blue, firm berries with a classic sweet Blueberry flavor. It brings just a hint of acidity to spice things up. Excellent! This Blueberry makes incredible pies, crisps and muffins and delicious jams and preserves. Wonderful for fresh eating straight off the bush into a bowl of hot cereal is a healthy way to start your day. Polaris features a tight form and may just be the perfect Blueberry for your small garden. It performs great in big gardens, too! Use as an accent plant in the landscape or as a low border plant. It produces between 3 to 8 pounds of fruit per plant when planted with other Half-High selections. 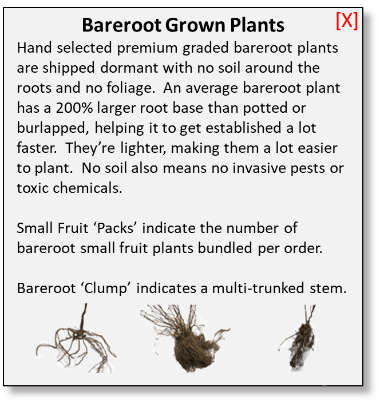 Increase your crop load and extend your harvest by planting assorted Half-Highs with different ripening times. Polaris shares the dense foliage and small stature of the Lowbush types of berry, and the fruit size and larger yields of the Highbush selections. This combination results in a plant that is covered with fragrant, white, bell-shaped flowers in the spring. Next, comes the medium sized, light blue, early season fruit. The season finishes up with a wonderful display of amazing red-orange fall color. Polaris Blueberry does great in containers. It can also perform beautifully in the landscape with other ornamental plants. For best results, make sure you have good drainage and a soil PH of 5.5 or less. If your climate seems too cold for Blueberries - or you thought you did not have the space for them - then Polaris is definitely for you! Partner with Northblue and Northsky to get the largest yields.